ATG, which operates in the field of IT, develops and implements computerized systems for the local municipalities and other public institutions, as well as providing consultation and guidance in all matters of IT systems. ATG also supplies the infrastructure for over 70% of the municipalities in the country and will allow access to information and data viable for participating ventures. The cooperation with ATG will enable the ventures to expand and benefit from the range of services ATG provides in the framework of IT as one of Israel’s largest data transmission networks. 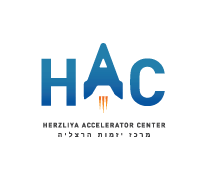 Herzliya Accelerator Center, awarded for the Most Innovative Program by the Federation of Local Authorities in Israel, has extensive experience in supporting the development of dozens of projects in various verticals under Smart Cities. With success rates above 55%, 28 VENTUREs have currently participated in 4 waves up until 2018, generating 16 successful companies. HAC advisory board features leading entrepreneurs of their fields such as Adan Shochat, Moran Nir, Yoran Bar, Samuel Balanga, Liad Rubin, Adi Zamir, and Tair Kowalsky. The participants will enjoy the Herzliya Municipality’s international cooperation with Twin Cities, international delegations, and international exchange programs. At the end of the Acceleration program, a Demo day will be held in front of investors and industry decision-makers. Selected participants may be candidates for presenting in an international arena (as been done with HAC Alumni who participated in two delegations – China and Barcelona, during 2018). Conduct simulation procedures on real database produced by the ATG. Assistance of leading mentors in the fields of: investments, fundraising, product, legal, business development, negotiations and more. The potential opportunity to conduct a POC/ Pilot with Herzliya Municipality and or ATG. Potential participation in ATG’s business development activities. Access to relevant database of the Herzliya Municipality produced by the local government officials as well as access to ATG partner’s produced databases. Access to Herzliya Municipality officials (deputy mayor, departmental managers, and municipal corporations) as well as expert employees of ATG and other companies. Ongoing support of leading professionals in the following fields: Big Data, communications, IoT, cellular, Information Security, Blockchain, and Shared Economy in the municipal sphere. View Website help me with my essay.